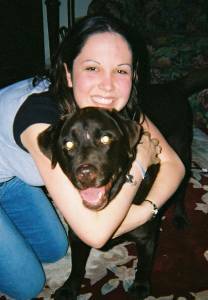 Samantha, a chocolate Labrador Retriever, was adopted by the Bagnall family in July, 2003. She loves to play with her golden Retriever brother "Milo", and is shown here after bathtime and getting a hug from her human "sister". 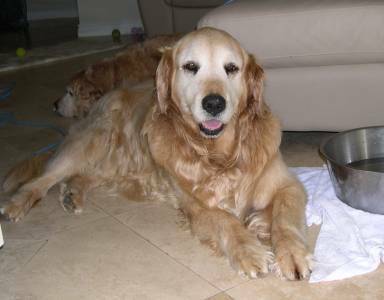 Riley, a 11 year old Golden Retriever, captured the heart of a shelter volunteer who contacted RFSC about this sweet boy. He was in foster care a brief time when the Henchbarger family took him home to join their other three RFSC senior rescues - Chelsea, Bubba and Angelina! 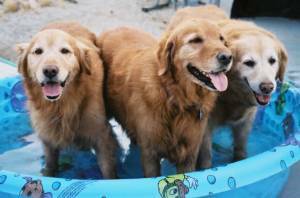 Fred (formerly "Moses", pictured left) and his mother, Ginger (middle), were rescued from a San Diego county animal shelter. Ginger had a massive growth on her side that we had removed and had quite extensive follow-up care post-op. 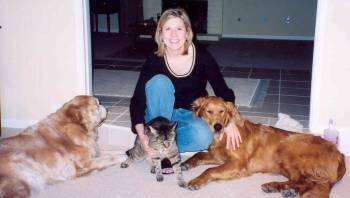 Fred was neutered and waited for his mom's recovery, when they were adopted by the Spencer family. 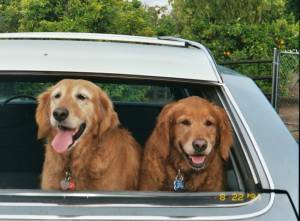 They are shown here with their new "sister", Goldie (right). In addition to their plastic pool, they also have a full-sized swimming pool in their yard and go for frequent camping trips in the mountains! Chip, a 10 month old pup, entered rescue with his littermate Loki (see next Success Story below). The pair was a handful and needed their own separate homes where they could receive individual training and attention. Chip fit in nicely with the Kosch family, where he is shown above right with his new mom, canine sister Zoe and kitty friend. Luke (previously "Loki") LOVES water. 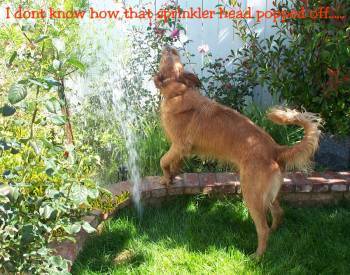 He is a master at removing sprinkler heads! 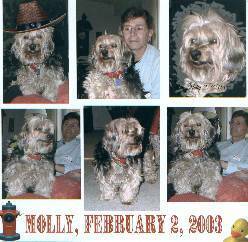 He was adopted by the Griggs family in May, 2003. Sierra was just a small little pup when she entered rescue. Her family was overwhelmed with caring for her and their baby. The Leach family was so happy to be chosen as her new "parents". She is shown here with her new brother, Max, whom she adores and follows around. Molly is a photogenic little girl, and she often poses for the camera! She was adopted by the Rankin family! Dolly loves her new home and especially enjoys her blanket on the couch! She was adopted by the Walton family. Cooper (a.k.a. 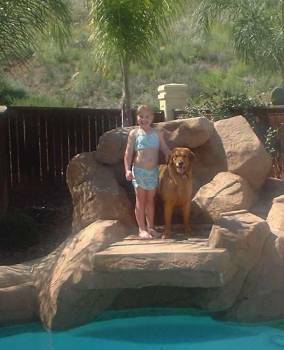 "Copper") is shown with his new sister by the pool in which he LOVES to swim. He was adopted by the Moore family, and his dad proudly boasts that Cooper loves him the most! 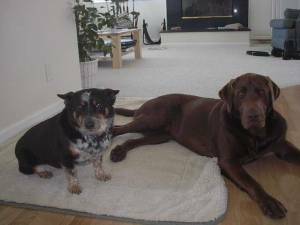 Rooke, a young Chocolate Lab, joined the Smith family and is shown with his new pal, Rylie. When he's not lounging around the house, Rooke enjoys playing ball and frisbee in the yard. 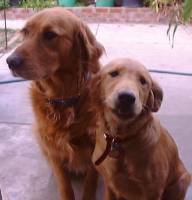 Mary (formerly Goldie) and Martha (a.k.a. Belle), were adopted by the Garczynski family and are shown here getting ready for a ride in the car!